Whiteningboost toothpaste is an intensive toothpaste to be used for two weeks at a time when you want to freshen your teeth a little extra. In addition, the toothpaste contains potassium nitrate that counteracts sensitivity and fluoride that protects against caries. BrilliantBoost TM - technology is a unique combination of active ingredients that effectively dissolves surface stains without damaging abrasives. It contains a higher concentration of active ingredients than our Whiteningevo toothpaste and is therefore suitable as an intensive product to be used now and then. 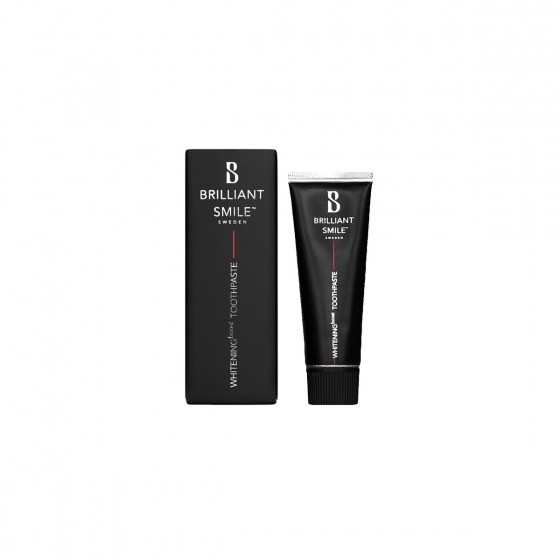 Thereafter maintain your teeth with Brilliant Smile Whiteningevo toothpaste. Pregnant and nursing mothers can use toothpaste.